10g of protein per bar. Simple... isn't it?. Gluten free. 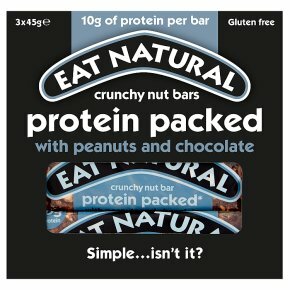 Ok for veggies.Protein packed* *Contains more protein than any other Eat Natural bar Peanuts Has there ever been a food quite as under-rated as the humble little peanut? At Eat Natural, we love 'em. With more protein than any type of nut, these lovable legumes are full of flavour and crunchiness - your own pint-sized, protein-providing package. Dark chocolate Maybe it's a tad more indulgent than the more 'wholesome' stuff in our bars, but don't we all love a little bit of chocolate new and then? The thing is, our delicious dark chocolate chunks are just the most wonderful accompaniment to the less 'naughty' bits and bobs. Coconut There's nothings quite like the taste of coconut to conjure up a feeling of tropical indulgence. That's why we've mixed crisp, lightly toasted shreds into this recipe. There's another reason too.. coconut is a surprisingly good source of dietary fibre. Honey We're big fans of the humble bee. As far as we're concerned, you'll never match the natural sweetness of real honey. To ensure the very best harvest of rich, clear honey, we work hand-in-hand with a very select group of bee-keepers and small-scale produces.